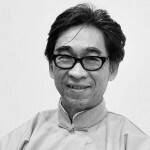 Johnson CHANG Tsong-zung, curator, guest professor of China Art Academy, art director of Hanart T Z Gallery, co-founder of the Asia Art Archive in Hong Kong, co-founder of the Hong Kong chapter of AICA. He has been active in curating Chinese exhibitions since the 1980s; he pioneered participation of Chinese art in international exhibitions, and was instrumental in establishing the international image of Chinese contemporary art of the 1990s. As a curator with strong attachments to the literati tradition, he firmly believes that contemporary art should have unique responsibilities under different contexts and take diverse paths. One of his main concerns is ways Chinese art may contribute to world culture. In recent years, a new aspect of his activities centres around the “revival of Chinese visual and material culture” through the intervention of curatorial practice. These projects involve artefacts, space and ritual, forming a special and unique chapter in Chinese contemporary art. His exhibitions include “China’s New Art Post-1989” in 1993, Special Exhibitions at the Sao Paulo International Biennial in 1994 and 1996, Hong Kong participation at Sao Paulo Biennial 1996 and Venice Biennial 2001, the “Power of the Word’ series of exhibitions, “Strange Heaven: Chinese Contemporary Photography”, “Open Asia International Sculpture Exhibition” in Venice 2005, “Yellow Box” series of research projects about contemporary art practice and Chinese space, co-curator of Guangzhou Triennial 2008.